When jcrew announced they had made up a holiday known as ‘National Stripes Day’ it just sounded like too much fun not to join in on the celebration. After all, who doesn’t have a stripe or two (or three or . . . ) sitting around their closets? We hadn’t planned on celebrating in the rain but mother nature decided she wanted to join in as well. And what a perfect day to bring out our striped umbrella which fit right in with our holiday. Is it just me or is there something about stripes that bring out playfulness and energy and joy? There’s one thing for sure, the possibilities for wearing stripes is endless. Striped pants, dresses, skirts, blazers, blouses, knit shirts, shoes, and even swimwear, all in a variety of splendid colors. Today we staying with striped pants and knit shirts and a trusty umbrella all in the traditional blue and white. So . . . are you celebrating National Stripes Day? Your grands are so darling! Such a blessing. Gotta love this rain we are having the best part is the blue skies after. Have a wonderful day! Jo, it’s so good to hear from you! And yes, the rain is making it absolutely beautiful here. This is adorable Trina! 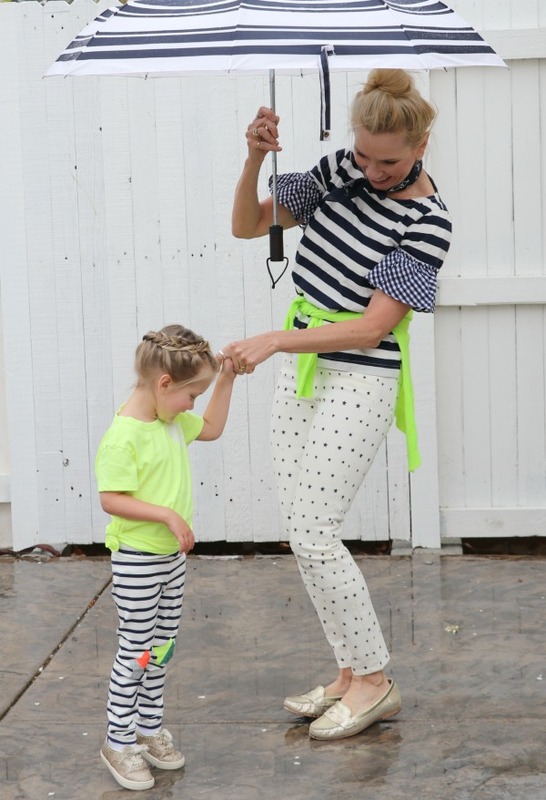 I love the children’s little outfits, look at those striped pants! Your top is so pretty with the fluttery sleeves and I loved that you mixed polka dots with the gingham and stripes! I just bought a striped dress I hope to wear on the blog soon as I dont have many stripes in my closet but love that this top is unique and has added flair! Thank you ever so much you cute lady. Can’t wait to see you in your stripe dress. Some of the cutest pictures ever! Love it. I live in Salt Lake as well and it totally brightened my day. Thank you Rina. It’s wonderful to hear from a someone in my home town. We need to get together some day. It would be fun to meet! I live in Sandy. Well, you made my day from your sweet comments, thank you beautiful friend. Your shirt is so cute! Not to mention the kiddies! Adorable! Thank you and thank you! I kind of adore these two little ones. I actually tried to talk Tori into stepping in instead of myself but the silly girl wouldn’t have any part of it.